If you live on another planet, you probably don’t know that WhatsApp (recently bought by Facebook) is the most popular cross-platform mobile messaging app which allows you to exchange messages (without having to pay for SMS), create groups, send unlimited images, video and audio media messages between members all over the world. In order to use the Android SDK you must first register your application on Kii’s developer portal. Once registered, your application will have an associated App Key and App ID that you’ll use to initialize the SDK. Press the “Create App” button.This bring up the “Create An App” menu. Enter the name of your app, select the desired server location and the mobile platforms you’d like to use (for this project you should select Android) and then click on the “Create” button. These are your application’s credentials which will be used by Kii Cloud to uniquely identify your application. Copy these credentials and add them to the project’s constants file called ApplicationConst.java. This will be used in the next step: initializing the backend. It’s now time to link your actual app to the app backend that you created in the previous step. In a nutshell you’ll have to add our small SDK library to your Android project and initialize Kii with the App ID and App Key. Let’s take a closer look at this. Make sure it’s included in your project’s properties as a referenced library. C2DM permissions are necessary to perform push notifications for messaging in the app. Add the following code to initialize the SDK on the class KiiChatApplication. // Configures the SDK to use the specified Application ID and Key. // It must be called prior to any API calls. Insert your application’s credentials (i.e. APP_ID and APP_KEY) in the placeholder parameters of this method. Also pass the Server Location (Site.US, Site.JP or Site.CN) that you’ve specified on the developer portal (defines the location of the backend server, the closer it is to your users the faster). IUser: an interface for the basic user info (username, e-mail and uri). KiiObjectWrapper: It’s just a wrapper to quickly get and set key/value pairs on a KiiObject as well as to get low level object info (id, created time and modified time). ChatUser: a wrapper for ChatUser objects that extends KiiObjectWrapper and implements the IUser interface. This is simply an abstraction for users of the messaging system. ChatUser objects use an app scope bucket for storage. ChatFriend: also a wrapper for ChatFriend objects that extends KiiObjectWrapper and implements the IUser interface. It’s similar to ChatUser but difffers from it since objects are stored in a user scope buckets (which makes sense since only a user should be allowed to see his/her friends). ChatMessage: a wrapper for ChatMessage objects that extends KiiObjectWrapper (the message itself will be a KiiObject). ChatRoom: an abstraction for a chat room of users in a KiiGroup and an associated message list. ChatStamp: a wrapper for ChatStamp objects that extends KiiObjectWrapper (the stamp itself will be a KiiObject). Stamps are images that can be sent as messages in a conversation. We’ll explain each class of the model in more detail as we introduce the app’s functionality (more below). With a Kii user builder you can build a user using a username, e-mail and/or phone. After you set the basic info on the builder the KiiUser.register() method just takes a password as parameter and you’re done! (We use the blocking register API call here since this is already part of an Android async task). You probably noticed unlike the previous registration example we’re now passing an implicit callback to make an asynchronous call (the user registration call was inside an Android async task in the previous example so it wasn’t necessary to use a callback though you should know it’s available). The advantage of using Kii’s non-blocking APIs is that the communication with the backend runs on separate thread and the initiating method call returns right away (you process the backend result when the callback is called) which is useful to avoid blocking the UI. Besides obtaining a ChatUser other important tasks are performed during ChatUserInitializeTask.initializeChatUser() that prepare the user for receiving push notifications. We’ll cover the code on the next sections. To wrap-up the user onboarding mechanisms let’s take a look at the Facebook based authentication. Kii allows you to use Twitter and Facebook based app authentication via Kii Social Connect. With it you can let your users to sign-up and sign-in to your app with their Facebook accounts by just adding a few parameters in the developer portal and a few lines of code in your app and you will be social-ready! To get started, you first need to create a Facebook App and get your Facebook Application ID. Please refer Facebook’s official guide for the detailed instructions. You can also get more information in one of our DZone’s external article. Please execute the following step on the developer portal to configure your application by setting your Facebook Application ID. Click on the “Edit” button in your application console at the developer portal. Click on “Settings” to bring up the application’s configuration menu. Creates a social network connector instance with the socialConnect method passing the target social network service name (SocialNetwork.FACEBOOK in this example). Initializes the social network connector with the initialize method passing the Facebook App ID. Starts the sign-in process with the logIn method. If the specified Facebook account is new, the SDK will first execute the sign-up process if necessary. This method is non-blocking, so it uses a callback to get the results. Note that you can also link and unlink Facebook accounts on Kii users as described in our Facebook integration guide. That concludes out user onboarding functionality. Let’s now continue with the functionality to add friends for chatting after you successfully login to the app. As you can see in the code if you use the keyword * as search term then a clause-less KiiQuery is created (equivalent to a “catch all” query) to get a list of every registered user. When you add a friend the ChatUser is converted to a ChatFriend and it’s then maintained in a separate list of friends with very similar characteristics as to what was described for global users (except that friends are kept in a user scope bucket which is only visible to each user). In the above code you can see that a ChatRoom is matched to a KiiGroup. Then the target user (the one that will be contacted) is added to the group. A group scope bucket is used here to hold the messages sent by the users and the current user is subscribed to receive push notifications from it (all subscribed users to the group bucket will receive a notification when a new message is posted). Finally a message is built with the chat group URI to notify the target user of the invitation. As you can see above push notifications are initialized for the current user, a KiiTopic is created to receive invite notifications and its permissions are changed to allow any registered user to send an invitation. Finally the current user is subscribed to the topic so it can receive invitations. Here the message is saved in the backend triggering a modification in the user group associated with it. All group members will get a push notification when this happens. Note that an analytics event is also sent (for detail see ChatStamp.sendUsageEvent()). Kii Cloud can aggregate this type of events (and also any stored data) to later offer you the chance to create metrics and slice and dice the information (with advanced visualization) from a convenient web console. First of all the wrapped object is saved (this is exactly the same as saving an object on Kii Cloud that has no association to a file). Then, if the ChatStamp has an associated image, we retrieve a file uploader from the Kii object and transfer the image file to the cloud as an object body (the null parameter on transfer() means we’re not passing a callback to get feedback from the transfer outcome). If the object already has an object body on the cloud then uploading a new file will replace it. Note that if the upload gets interrupted it will be suspended and a SuspendedException will be thrown. In that case, you can resume the upload (see Resuming Uploads). Finally the associated image file is moved a local cache which will later help to accelerate image loading. The concept is very similar to the image saving code but now we use a file downloader. and load the image directly into our local cache (if it’s not already present in it). Finally, from the local cache we return the image file as a bitmap for displaying. As you can see Kii Cloud gives you all the functionality of a robust, scalable backend by just adding a library to your project and using a simple client side API designed to match your backend management needs but providing a higher level of abstraction. You need to import following project to your workspace if you use Eclipse. KiiChat uses GCM (Google Cloud Messaging) in order to send push notification and GCM needs google account. 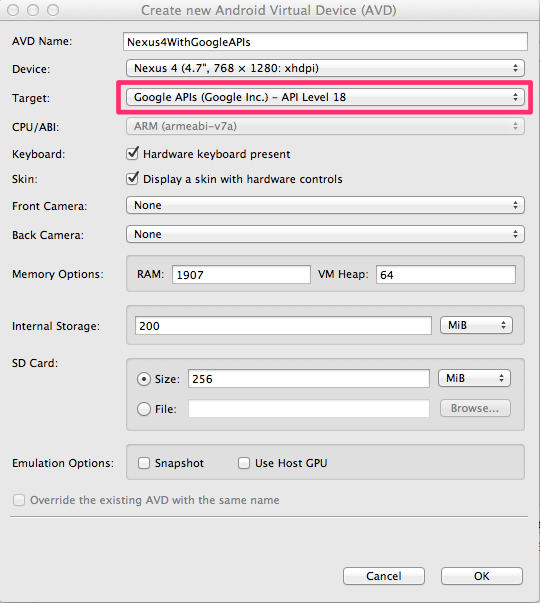 So you need to set up the google account on your emulator. If you have any questions, please feel free to ask at community. Thanks for relying on this tutorial! Stay tuned to blog.kii.com for more tutorials, announcements and demos.